Published in association with the Strategic Management Society, The Wiley Strategic Management Series aims to illustrate the best in global strategic management for academics, business practitioners and consultants. This book expands the understanding of strategic opportunities presented by the far reaching developments unfolding in the rapidly changing world economy, and in particular how they are impacting the North and South American continents. This wide-ranging collection of papers comprises a rich body of research and experience, spanning academics, business executives and consultants. Key emphasis is placed on competition and core competence, joint ventures and strategic alliances, and corporate performance. Writings included in this volume were selected as being representative of some of the most significant issues currently facing business strategists. About the Editors Howard Thomas is Dean of the College of Commerce and Business Administration at the University of Illinois at Urbana-Champaign, and James F. Towey Professor of Strategic Management at UIUC. He became Dean in May 1992, after serving as Interim Dean since August 1991. Prior to this he was Foundation Professor of Management at the Australian Graduate School of Management, AGSM, Australia's National Business School in Sydney, New South Wales, and Director of the Doctoral Program at London Business School, England. He is internationally recognized as one of the leading experts in the field of strategic management theory. He serves on the editorial boards of various management journals and is Vice President of Publications and President-Elect for the Strategic Management Society and has published widely in the areas of corporate and competitive strategy. He has an international reputation as a consultant in strategy and serves on a number of boards. Donald O'Neal, MBA and PhD (Business Administration), University of Illinois is an Assistant Professor of Management at the University of Illinois at Springfield. After a successful business career, including management positions in engineering and sales, and, latterly, as Vice President of Human Resources, he studied for a doctorate in strategic management at UIUC. His interests include research in corporate governance and consulting in the areas of strategy and leadership. Raul Alvarado has formerly been Professor and Head of the Business Policy and Strategy area of IPADE Business School of University of Panamerica, and served as member of its Harvard IESE Advisory Committee. He has also been Visiting Professor to a number of universities, and acted as consultant and lecturer to many national and international businesses. He has written several papers and cases on Strategic Planning, Leadership and International Business. 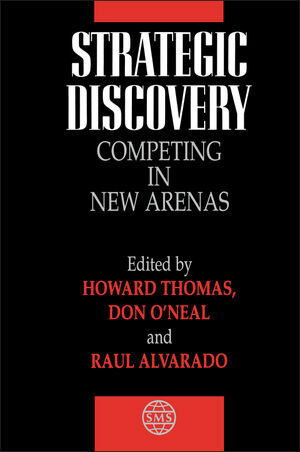 Technological Complexity and the New Architecture of Competition(P. Norman & R. Bettis). Developing Global Strategies for Service Businesses (C. Lovelock& G. Yip). Competence-Based Strategies when Facing Innovation: But what IsCompetence? (T. Durand & S. Guerra-Vieira). Competing to Cooperate: Antecedents of "Follow-the-Leader" Behaviorin US Joint Ventures in Latin America (J. Gimeno & R.Hoskisson). The Benchmark Ford-Mazda Assembly Plant in Hermosillo Mexico (G.Bannister, et al.). Corporate Restructuring: The Result of Good or BadGovernance? (S. Chatterjee & R. Kosnik). Who Wins in Governance Reform? : Conventional Wisdom 1, Shareholders0 (B. Boyd, et al.). Measuring the Distribution of Returns among Stakeholders: Methodand Application to US and Japanese Auto Companies (M. Lieberman& A. Chacar). The Transformation of Fiat Auto Poland (K. Haanes et al. ).